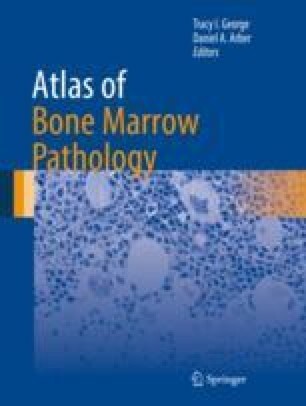 Recognition of bone marrow pathology requires an understanding not only of normal marrow cytology and architecture but also of the myriad ways in which the marrow can change in response to extramedullary insults or stimuli. Reactive marrow changes can be quantitative (hyperplasia or hypoplasia) or qualitative (left-shifted maturation, cytologic atypia), and they can affect one or multiple hematopoietic lineages as well as the lymphoid, histiocytic, or stromal marrow compartments (Figs. 2.1, 2.2, 2.3, 2.4, 2.5, 2.6, 2.7, 2.8, 2.9, 2.10, 2.11, 2.12, 2.13, 2.14, 2.15, 2.16, 2.17, 2.18, 2.19, 2.20, 2.21, 2.22, 2.23, 2.24, 2.25, 2.26, 2.27, 2.28, 2.29, 2.30, 2.31, 2.32, 2.33, 2.34, 2.35, 2.36, 2.37, 2.38, 2.39, 2.40, 2.41, 2.42, 2.43, 2.44, 2.45, 2.46, 2.47 and 2.48).